The screams�the grisly sound effects�the rumbling organ music. 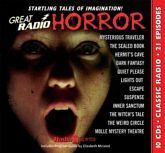 Sounds in the dark come strange, mysterious, and terrifying in twenty-one episodes of such classic series as Lights Out, Inner Sanctum, Suspense, and many more. Spine-chilling tales by Edgar Allan Poe, Guy de Maupassant, Arch Oboler, Robert A. Arthur, David Kogan, and Alonzo Deen Cole dabble in dark realms. Boris Karloff, Maurice Tarplin, Paul McGrath, and Bernard Lenrow deliver pulse-pounding performances as the haunted and the hypnotized who come face to face with forces beyond their comprehension. Includes an informative Program Guide by broadcast historian Elizabeth McLeod!